"During the last thirty years of the nineteenth century the Nandi became the most powerful people in western Kenya. They frequently went raiding, but only in small units because their raids were to capture cattle, not win more territory. Their rise as a military power was largely due to the decline of Maasai power. "In the 1870s, after the Maasai civil wars, the Nandi defeated the Kwavi and the Purko. By the 1880s they were raiding all their neighbours except their Kipsingis cousins." "The Nandi were one of a group of related tribes who lived in the forested hills around Mount Elgon in northern Kenya. They called themselves Chemwal or 'cattle-raiders'; the name Wa-nandi was a Swahili insult, meaning 'cormorants' and referring to their rapacity. Few outsiders visited the area before the 1880s, although some Arab or Swahili traders may have arrived in the 1850s. The tribe was not interested in foreign goods, however, and attacked the caravans instead of trading with them. Kapchumba or 'place of the Swahili' was a commonplace name in the Nandi country, which was said to commemorate locations where the foreigners had been lured into ambushes and massacred. "During the 1890s the Nandi began to raid the telegraph line which the British authorities were building on their borders, mainly because they valued the wire as ornaments for their women, and later the heavy iron bolts securing the rails of the Uganda Railway were stolen for use as weapons. This led to a series of British punitive expeditions, the first of which took place at the end of 1895." "Despite their small numbers (their total fighting strength was around 5,000, but most war parties were far smaller than this) the Nandi had a fearsome reputation as fighters, and the Masai were said to have been the only people who dared to attack them. Traditionally their warfare consisted of small-scale raids for cattle and prisoners. After the 1880s, when they seized the grazing grounds of the Uasin Gishu plateau from the Masai, the Nandi showed no further interest in territorial conquest. They did not keep slaves; prisoners were usually ransomed for cattle, though Masai captives were sometimes adopted into the tribe. "Each luket was divided into a varying number of sub-units or siritaiik, each comprising anything between 20 and 50 men. The leaders of each of the individual siritaiik held the title of kirkit or 'bull'." "One group which steadfastly opposed the British in East Africa were the Nandi, who lived in the hills to the north-east of Lake Victoria. Their resistance lasted from 1897 to 1905, and took the form of attacks on European traders, outposts and railways. A number of punitive expeditions were mounted to suppress them, each more or less of a pattern: African troops in British employ marching into the Nandi country, and bringing the warriors to battle. Initially the Nandi had no fear of firearms, having discovered that it was possible to overrun the Europeans while they were reloading. They therefore attacked with great courage and daring; but the changed military conditions ofthe 1890s meant that they were usually driven off by Maxim and rapid breech-loading volley fire. A favourite Nandi tactic was to attack encampments at night, and on several occasions their charges penetrated protective thorn barriers, zaribas, before they were repulsed. Nandi resistance finally collapsed in 1905 following the death of an important leader, apparently under treacherous circumstances." "In appearance, the Nandi warriors were similar to the more familiar Masai, although their battle finery was not quite so ornate. They wore a length of hide, coloured with red ochre, wrapped around their bodies .... [and] headdresses of lion- and monkey-skin." "During the second half of the 19th century Masai influence became increasingly strong among the Nandi. Individual warriors often copied elements of Masai war dress, such as the ostrich-feather headdress ..., white monkey fur anklets, horn or ivory armlets, bells on the thighs or ankles, white or coloured cloaks and vulture-feather capes .... Nandi clothing was traditionally made from black goat skin. Men grew their hair long, and either dressed it in numerous small tags hanging over their foreheads, or plaited it into pigtails -- usually one at the front and either one large one or three small ones behind. Richard Meinertzhagen, in his account of the 1905 campaign, mentions warriors wearing red and white body paint ... smeared in both colours, divided down the centre." "[C]ontrary to the statements of most eyewitnesses[,] few of these men have adopted either Masai headdresses or or the practice of painting their shields." Their weapons consisted of the sime, a short sword in a leather scabbard, common to many East African groups; and either a bow and small quiver of arrows, or a long-bladed spear. Towards the end of their campaigns they did acquire a number of firearms, but remained poorly armed." 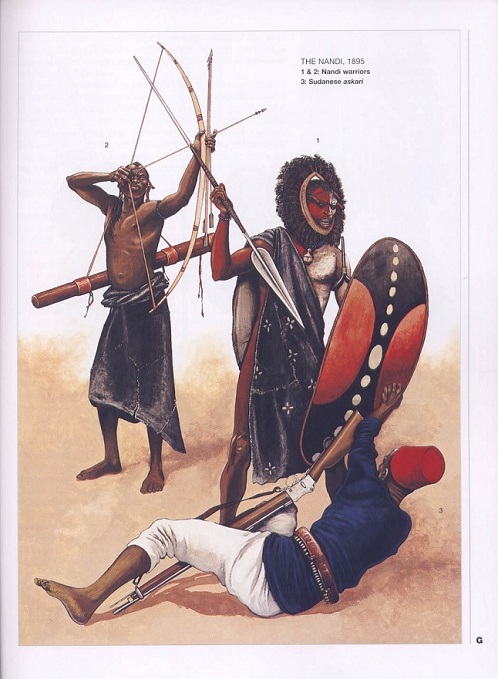 "Weapons were spears, swords and clubs -- all very similar to Masai types -- as well as bows and arrows.... [T]he Nandi had once been forest-dwelling hunters, and so had a long tradition of archery which persisted even after the adoption of Masai armament and tactics." Shields were very similar in shape and construction to those of the Masai, although according to Vandeleur the ones he saw in 1895 were painted 'a dull red colour', and were not so 'finely ornamented' as the Masai ones. Several surviving photographs from the early 20th century portray shields in a single solid dark colour (probably red), while other sources suggest that bold but rather crude approximations of Masai patterns in white, red, black, grey or blue were equally popular." "[T]heir shields were the large oval Masai type, decorated with simple devices painted in ochre."